When the people talk, I listen. And all the folks who have e-mailed, commented or tweeted about El Mundo had a clear message: this Mexican restaurant is the perfect destination for a $10 Challenge. So I used my birthday and my roommates’ big hearts (and wallets) as excuses to visit the Frankfort Avenue restaurant. El Mundo isn’t like most Americanized Mexican places that I’m used to visiting. Gone are the bad murals of haciendas and medleys of Spanish singing over the speakers. Same goes for the identical menus and indistinguishable dishes covered in melted cheese. This restaurant takes traditional Mexican dishes and shakes them down Kentucky-style by infusing food with local ingredients and giving the finger to what people expect from a Mexican restaurant. The restaurant’s set up smacks you in the face upon arrival. The kitchen is completely open to the dining area, which gives visitors a front-row view of how their meal is prepared. The dining area is tiny – a ledge in the window with a few bar stools and four tables are the only seating available inside. The walls are covered with maps of Central America, portraits of Frida Kahlo and plaques commemorating how many best of Louisville lists have featured El Mundo in top slots. The menu is like the decor – somewhat familiar with unexpected twists thrown in. For example, diners can choose between standard chicken, pork, vegetables or black beans as filling options for burritos, tacos and other entrees, but the restaurant also offers ground Kentucky bison, a meat that is quickly becoming one of my favorite lean options. Many of the lunch and dinner entrees hover between $8 and $9, such as the quesadilla, soft or hard tacos and the chile relleno (all $8.25). But if you have a couple of extra bucks, some items on the dinner-only menu looks like it’s worth the splurge, such as fish tacos ($11.25), southwest green chile enchiladas ($12.95) and carnitas ($11.25). One of the downsides of this Louisville take on Mexican food is that the chips and salsa that usually await when I’m seated at a similar restaurant aren’t complimentary. Sure, the appetizer is only two bucks, but I missed a free, endless pile of crisp chips and chunky dip. On this visit, my roommates were picking up the tab, but I still wanted to adhere to $10 Challenge standards. I went with the garden burrito with Kentucky bison as the filling ($8.25). Garden burrito with Kentucky bison. 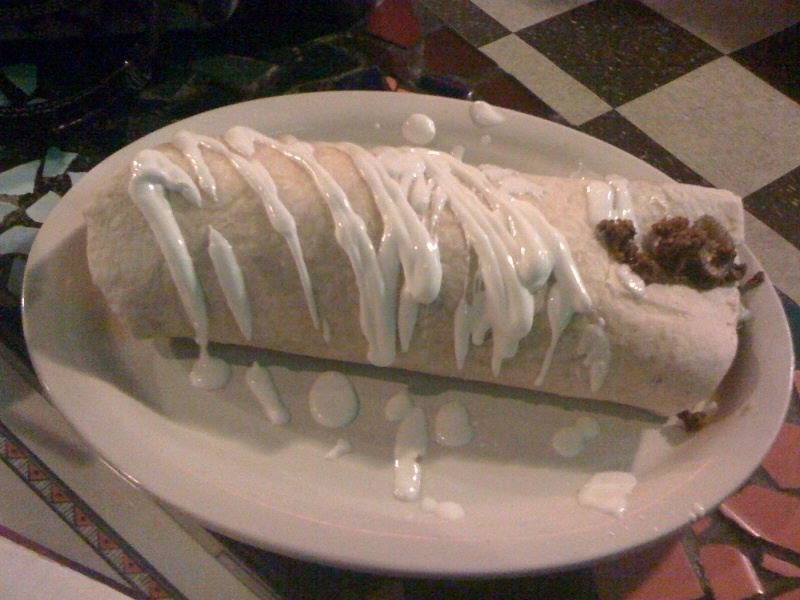 The guy at the register should have warned me about the size of the thing – the burrito was as big as my forearm. It was full of lots of crisp, fresh lettuce and chunky salsa fresca. Mounds of shredded cheese topped the ground bison meat, which was wonderfully flavored with a little bit of spice. The burrito would have been perfect if not for the temperature. The entire dish was cool, even though I saw the cooks making it fresh behind the counter. The cheese never melted over the meat, a pet peeve of mine. A couple of minutes in an oven would have sent this dish from pretty good to sublime. For all those who recommended El Mundo, are cold dishes the norm? Or did I just go on an off night? I’d like to visit El Mundo again because of the great flavors and variety, but I need the heat turned up. The restaurant is located on Frankfort Avenue across from Walgreen’s. Be prepared to park on the street. Menus are located at the register. Take one, step away from the counter, then return to the register ready to pay when you know what you want to order. El Mundo, 2345 Frankfort Avenue, Louisville, Ky.
Do you have a place that would be great for the Challenge? Leave a comment or send an e-mail. « Can government take away my Happy Meal?